Most Buddhists know Tara—simultaneously, a friend, savior, caring Bodhisattva and enlightened being. Hindus consider Her one of the Mahavidyas, or Great Wisdom Goddesses—a role she carries on in Buddhism. To advanced practitioners, she is equally the great Wisdom Mother Prajnaparamita. Yet, at the same time, without contradiction, Tara is the intimate and treasured friend. Do we really comprehend the vastness that is Tara? She is one of the most popular devotional and meditational deities, honored all around the world, practiced by all schools of Vajrayana Buddhism, many Mahayana Buddhists, Hindus, and others. She is so popular, she is called “Mama Tara”—and She never takes Herself seriously. She’s a daily good friend, ready helper, saving hero, precious guide. She always has “time” for everyone—after all, time is relative. She is just as quick to help the prisoner in jail as the faithful practitioner, without discrimination. If Her name is called, She answers. At the ultimate level, She was the “Non Manifested”, Prajna Paramita in Buddhism, but also the non-manifested Wisdom Mother in Hinduism. At the “intimate” relative level, She can emanate as a shepherd girl, ready to rescue a stranded traveler. Or She can incarnate as a Princess ready to help a nation—two simultaneously, in the case of Her more recent history in Tibet and China. Yet, Tara goes beyond any constraints of conception, and even imagination: Parajnaparamita, wisdom Dakini Varjayogini, Female Buddha, Consort of great Amoghasiddhi Dhyani Buddha, Hindu great mother, angel to those in distress — all of these and thousands more. 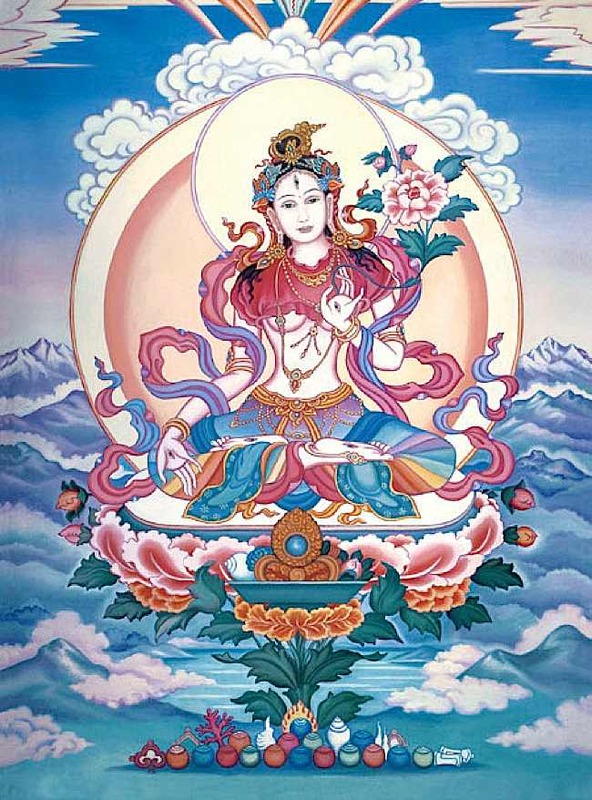 There are 21 famous Tara manifestations, one of which is the beloved White Tara. In Vajrayana’s higher tantras she is Chittimani Tara and also, Vajrayogini (Vajra Varahi). It can be confusing, Her endless labels, but at the same time it defines Her perfectly. She is known by endless names, but consistently as Tara, Arya Tara, and, in Tibetan, Jetsun Drolma. She is simultaneously the spiritual child of Avalokiteshvara, born of tears of compassion, and the Mother of the very same Buddha. Mother and child of the same Enlightened Being. Simply meditating on the vastness of these concepts is, in itself, challenging and rewarding. 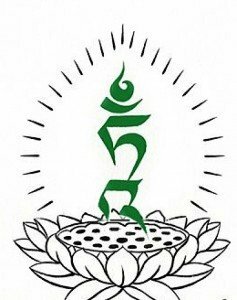 Simplified Sadhanas for the devout include Green Tara and White Tara practices that can be practiced with or without empowerment. As a practitioner progresses, Tara meditations can become more intense, with Highest Yoga Tantra practices such as Chittamani Tara. Even the famous 21 Taras, can be practiced simply—as a daily verse—or at the ultimate level, with 21 separate sadhanas and mantras (see below). 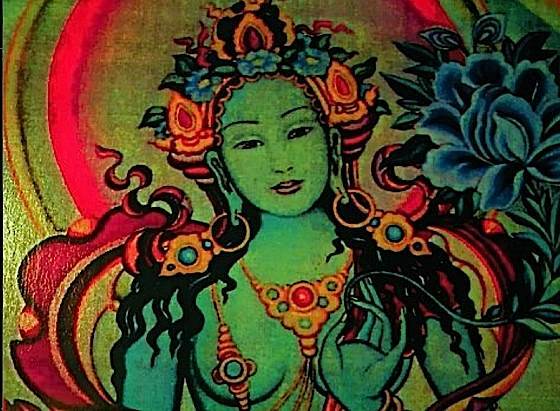 She can be practiced in the form of the great Black Dakini, Throma Nagmo, the wrathful form of Prajnaparamita—a Highest Yoga Practice (mana annut tantra). She can be practiced even without a name, just by simply imagining Her. There is, literally, a Tara, and a Tara practice, for everyone. Green Tara, Mother of All Buddhas. Inset is Venerable Zasep Tulku Rinpoche who frequently teaches reliance on Tara to his students. For those who take a special interest in Tara, highly realized teachers can initiate practitioners into more advanced meditations. Many gurus teach that Tara manifests to everyone, not just Buddhists. To Chinese Buddhists She is Guan Yin. Many non-Buddhist spiritual seekers—who have created their own path—have adopted Tara by name. One great Dzogchen Teacher, Chogyal Namnkai Norbu, said in his lecture on the 21 Taras that when he saw a great Madonna statue in Rome he knew it was Tara. Guanyin, the Chinese Buddha of Compassion. This is typical of the openness of Buddhists and Hindus, who have complete tolerance and acceptance for other traditions. It is also in character with Tara’s all-embracing maternal compassion. 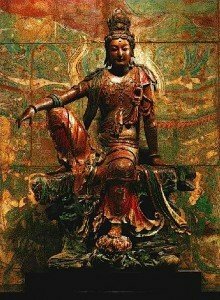 The reverse is not always true—it can unintentionally offend someone to state their beloved deity is the same as your deity—but, from a Buddhist point of view, there is generally no spiritual conflict in thinking of Tara as emanations in other traditions. Tara can manifest in myriad—literally endless—forms, suited to the need of the practitioner. Iconographically, She can appear in any color. Famously, She is Green Tara, the savioress—and chief manifestation of Tara. She is equally known as White Tara, the Goddess of Long Life and Healing. The 21 forms of Tara (according to Atisha in this Tangkha) are only the beginning of the endless emanations and depictions of Tara. She can be Ugra Tara, the Black Tara who is the secret Mantra emanation—the very source of All, since sound (or frequencies) are often considered the source of manifestation in some Budhdist and Hindu beliefs. Red Tara enjoys much love for her passionate role as the magnetizing Tara, who attracts and who helps beings with the power of positive attraction. Yellow Tara helps those struggling with poverty, or just to help provide the resources to help other sentient beings. In higher tantric practices Tara can manifest in the body mandala as simultaneous multi-coloured Taras at each of the body’s chakras. A red Tara from the 21 Taras according to Surya Gupta. Each implement in this visualization is meaningful, as is Tara’s red colour. This is the first Tara of the 21 Taras. 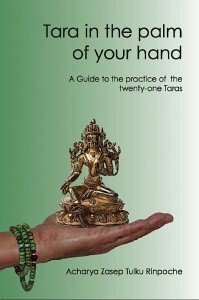 Tara in the Palm of Your Hand, a book by Venerable Zasep Tulku Rinpoche is available on Amazon.ca. The 21 Taras are among the most famous forms of the great Female Buddha. The praises to 21 Taras is still practiced every morning by the devout. Buddhist farmers routinely recite the praises as they work their fields. 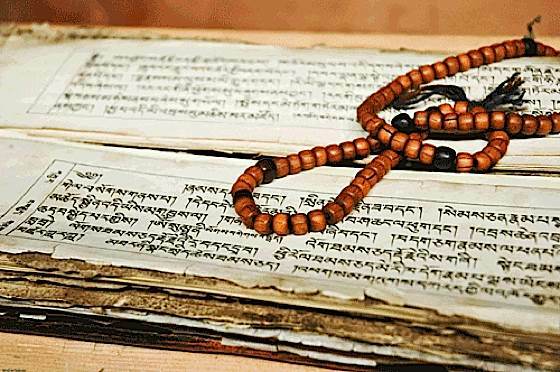 When in trouble—in need of rescuing, in prison, facing law suit, any distress—practitioners often recite either the main ten-syllable mantra, or the praise to the 21 Taras in Sanskrit, Tibetan or English (see Praise, below). There are literally thousands of stories of personal rescues from distress—by reliable sources—at the intervention of Tara, often precipitated by the simple calling of Her name, Her mantra or Her 21 Praises. 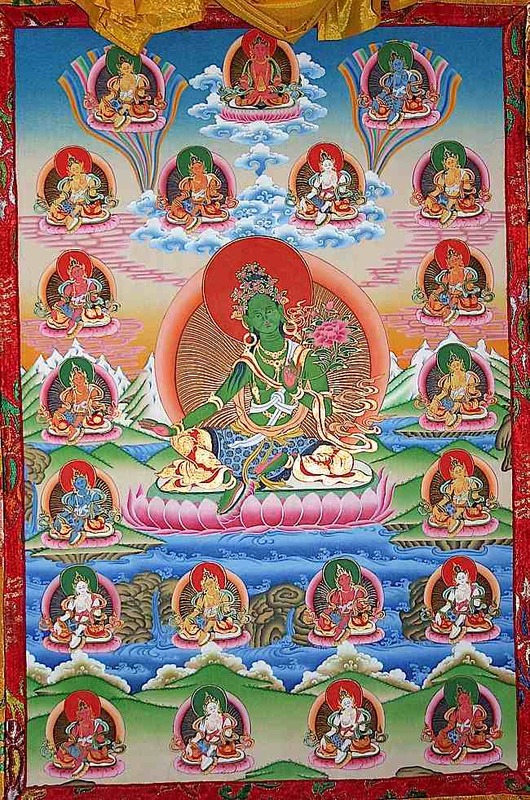 In the Atisha system, the 21 Taras are visualized as the same Tara, in different colors, with slightly different facial expressions, gestures, attributes and specialities. The second Tara according to the visually intense 21 Tara Surya Gupta visualization. In the wondrous Surya Gupta system, the 21 Taras become intense meditational visualizations, with each having different faces, some fierce, some semi fierce, some peaceful, together with a wide array of arms, implements, colors, backdrops, thrones and attributes. Each of the 21 Taras in the Surya Gupta system has its own sadhana—a ritual visualization requiring empowerment—whereas the Atisha system Taras can be visualized anywhere, quickly, and honored with a lovely, but quick verse. What does Tara Do? “Does” is a relative term. Relatively, She is wisdom in action. She is compassion in action. Tara is the penultimate combination of both wisdom and compassion. Ultimately, She is Wisdom realizing emptiness. Relatively, She is the ultimate action hero—means and method. Her names include “Swift Heroine,” which describes Her perfectly. In Tara, Wisdom and Compassion are perfectly combined. Who doesn’t love a mother? Whether by the name of Mom, Tara, Madonna, or Mother Earth, the mother is a universally approachable concept. Like a mother, Tara doesn’t question Her children. If we need Her help, regardless of our own blemishes, we will get Her help. Nothing can stand before a mother’s compassion. Literally, mothers have lifted cars off of trapped children. A mother would die for her family. Tara’s love goes even beyond this level. She loves all, with equanimity. White Tara. Mama Tara is adored by millions. In the famous story of Jigme, an ancient Tibetan tale, She continuously rescues wretched Jigme, time after time—even after he commits crimes and goes to jail. Endlessly, again and again, She comes to his aid. It doesn’t matter that he doesn’t learn his lessons. This is motherly love, for all, without discrimination. Tara rescues all, from the destitute to the Gods. An ancient tale, thousands of years old, tells how Tara, a Hindu goddess, rescues Lord Shiva, the God. Tara is a great wisdom goddess in Hinduism. 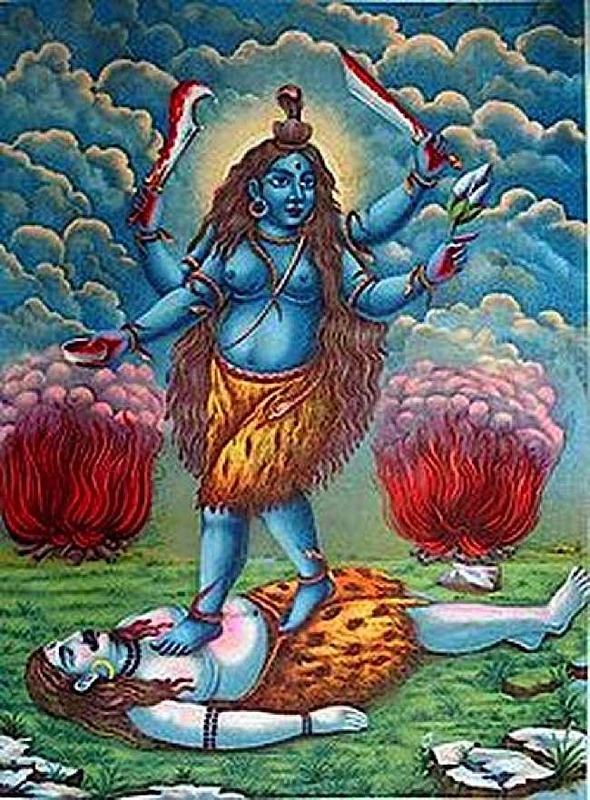 Tara Devi (Bengali, Devanagari) predates Shiva, and is one of the oldest known divine beings on record. Her Divine Name in Hinduism, as in Buddhist tradition, means “star.” In Hindu belief, she, like the star, is beautiful, but combustive, at her core the unquenchable hunger of life itself. She is the one who created the Seed from which the Universe took birth as Lord Vishnu. One of Her earliest legends, is also a “saving” act—familiar to Buddhists around the world. When Lord Shiva saved the world by drinking the poison created by the “churning of the ocean between the Devas and the Asuras” it was Maa Tara who saved Lord Shiva. She suckled Him from Her precious breasts, and neutralized the poisons. Maa Tara, is one of the oldest divine beings on record. She is a great wisdom goddess in Hinduism. Tara is also seen as a form of Durga or Parvati. As Maa Tara, She is most often seen as blue, with four hands, often standing on Shiva’s body. Like wrathful forms of Tara in Buddhism, She often wears severed human heads as a necklace, and other highly symbolic tantric icons. In Her four hands she carries a sword, severed skull cap, lotus and scissors. In Hindu practice, she has other mantras, including: Om aim hrim strim Tarayai hum phat svaha. No special initiations or practices are needed to bring Tara into your life. Simply speak Her name. Talk to Her. She’ll listen. In more dedicated practices, Her devotees would offer Her clean water bowls each morning. Tara doesn’t need our offerings, but our giving brings us merit—beneficial karma. Precious to Her is simple water, or any offering that does not arise from greed, killing, or any negative action. Water is “free”, so that anyone from penniless to prince can make a simple offering and enjoy Her blessings equally. Harmonically tuning with universal energies of compassion and wisdom, Tara’s mantra is most effective for healing, protection, or just simply building positive karma. This is pronounced Ohm tah-ray tew-tar-ray tew-rey svah ha. In Tibetan mantric recitation, svaha may be pronounced soha. In more advanced mantra practice, and in sadhanas authorized by teachers, Tara’s ten syllable mantra may be visualized surrounding the seed syllable Tam (shown in the centre). 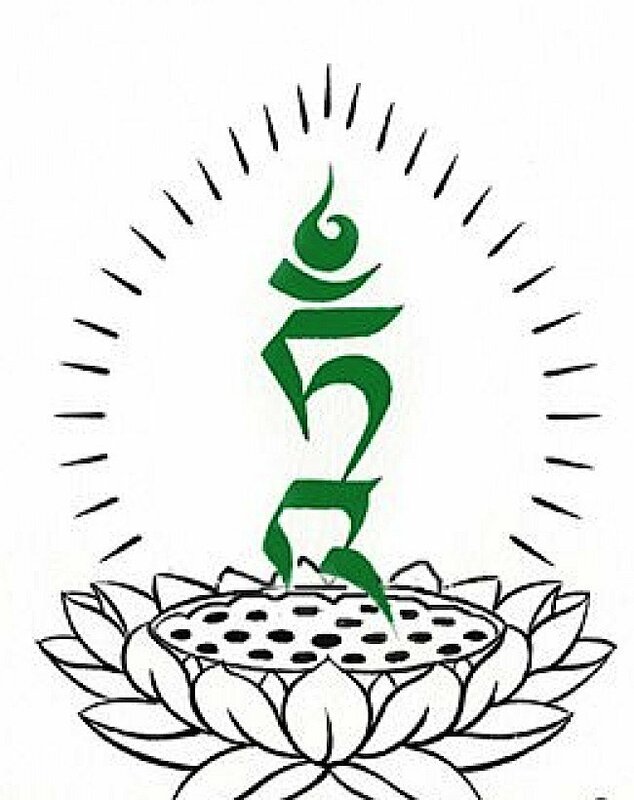 Surrounding the Tam, are the Tibetan syllables beginning at the top (Om) then left clockwise. 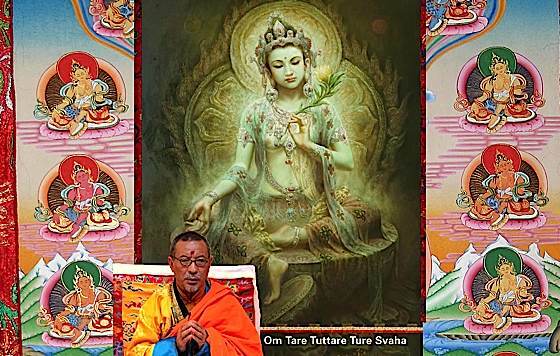 To benefit from visualization, while chanting the mantras, build more and more complex visualizations, beginning with Tara’s elegant beauty and important attributes, and progressively increasing the image in detail. The easiest approach is to study an image of Tara, preferably an ironically correct one—since very aspect of the visualization means something. One of the beautiful thangkas that kept showing up on the author’s Facebook feed. 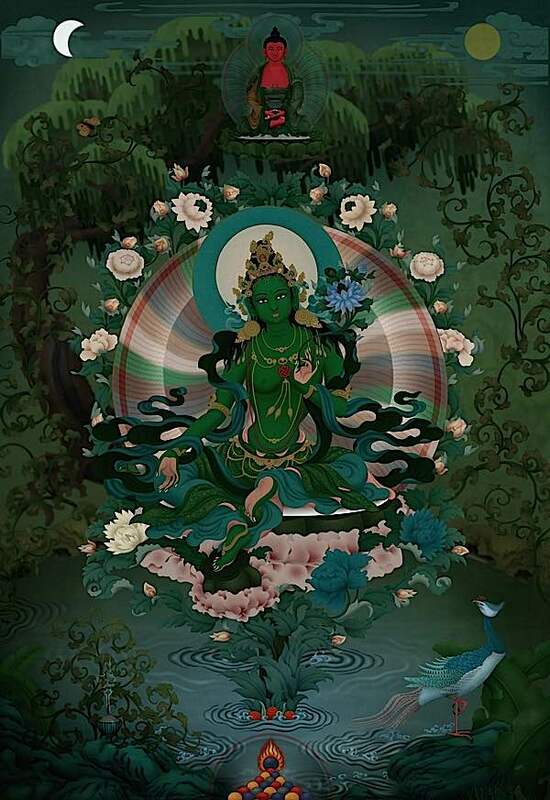 This is the Green Tara final art that we see Jampay Dorje working on in the feature image. 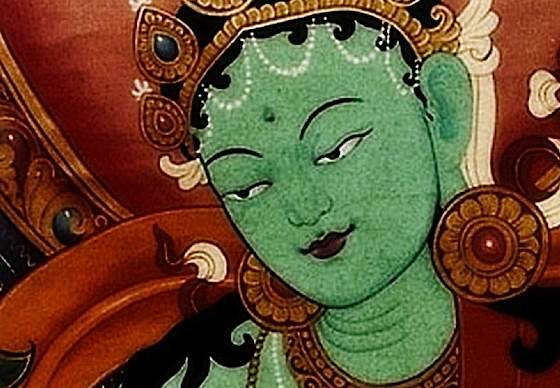 Your teacher, may give you a proper meditation, but if you have not yet formalized your practice you can think in these terms: Tara is a beautiful young deity, youthful, perhaps sixteen visually—certainly youthful and timeless—of emerald color. Her right hand is in the gesture of supreme generosity, hand open to give blessings, with thumb and index touching and the other three fingers outstretched. The touching fingers represent the union of Wisdom and Compassion. The three remaining fingers represent the three jewels: Buddha, Dharma and Sangha. In this hand She lightly holds the stem of an uptala flower, a blue Lotus. Her left hand is at her heart, in the gesture of bestowing refuge in the three jewels. This mudra (hand gesture) also incorporates the gesture of protection, of fearlessness. This time Her thumb and ring finger are connecting in the Wisdom-Compassion loop. She is saying, “come, I’ll protect you.” In this hand, too, is the stem of an uptala flower. There are three blooms, one open, one half open, one just about to open, representing the Buddhas of the past, present and future. She is adorned in the most precious ornaments, and seated in an aura of spectacular light. On Her head is a five-sided crown, depicting the five Dhani Buddhas. Above that, are ornaments, rainbow lights, wish-fulfilling gems. And surmounting all, is Her own Guru, Amitabha Buddha, the Buddha of Infinite Light, glowing red. Her legs are Her most significant attributes. One is drawn in, showing her mastery and enlightenment. Her other is outstretched, in a gesture that appears to indicate She’s ready to leap up to our aid. She sits on a moon cushion, which arises on top of a Lotus. In more advanced visualizations, at Her heart is her precious seed syllable, TAM (see below), radiating green light, sending out blessing energy to all beings in the universe. 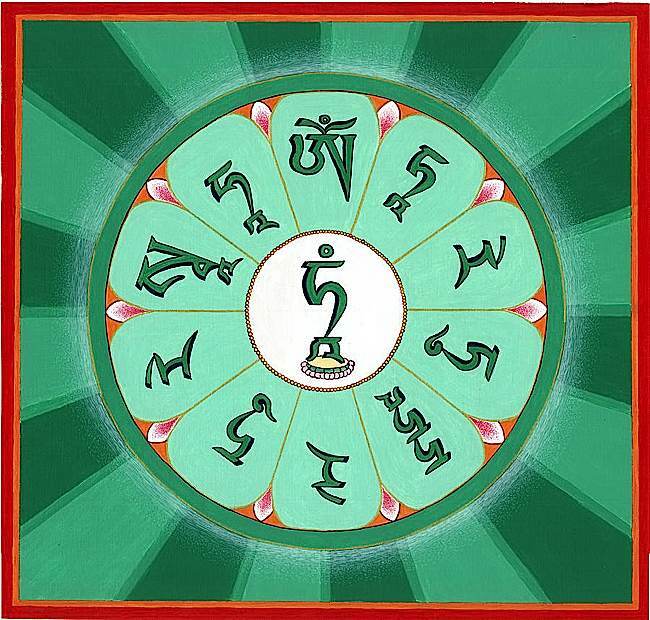 The Tam syllable, seed syllable of Tara, is most often visualized at Her heart, glowing and emanating healing green light. TAM normally sits on a lotus. Tara can be practiced by anyone, any time. She is all-inclusive. Although empowerments and initiations help advance our progress with Tara, none is required. Seven-limb practice: a seven limb prayer that re-affirms a good practice of praise, offering, declaration of non-virtues, request for Tara to remain as your teacher, request that Tara teach the Dharma, and a dedication of the merit to the cause for enlightenment. These basic practices, together, take five minutes, to which you might add the above visualization and mantra practices. Until I reach enlightenment, I take refuge in the Three Jewels: the Buddhas, the Dharma and the Sangha. By the merit of practicing generosity and other perfections, may I attain Enlightement in order to benefit all beings. May they never have suffering or its causes. To You Venerable Arya Tara, with my body, speech and mind, I respectfully prostrate. I offer flowers, incense, butter lamps, perfume, food, music and a vast collection of offerings, both actually set out and emanated through wisdom and imagination. I declare all my non-virtuous acts since beginningless time. I rejoice in the virtuous merit accumulated by Holy and ordinary beings. I request You turn the wheel of Dharma. I beseech You to remain until samsara ends. Please, with your boundless compassion, look upon all beings drowning in the ocean of suffering. May whatever merit I have accumulated be transformed into the cause for Enlightenment so that I may help all sentient beings. Around the world, many people begin and end their day with Tara’s twenty-one praises. This practice has been credited with many benefits, including protection from harm, prosperity, and swift progress on the path of enlightenment. Of Avalokiteshvara, protector of the three worlds. Of a thousand stars assembled. Pacification, patience, concentration, and all objects of practice. And upon whom the sons of the Victorious Ones rely. And who are able to draw all beings to you. Destroy entirely the magical wheels of others. You burn intensely within a whirl of fire. Slay all enemies without an exception. With the totality of your own rays of light. Conquer the demons and all of the worlds. Rescuing the impoverished through the letter HUM. Radiates eternally with great beams of light. And left withdrawn, completely destroying all the masses of enemies. All seven levels through the syllable HUM. The very object of practice, passed beyond sorrow. Overcoming completely all the great evils. And you rescue all through the knowledge-letter HUM. 17 Homage to you, Tara, stamping your feet and proclaiming TURE. And all the three worlds to tremble and shake. The hare-marked moon like the celestial ocean. You dispel all poisons without an exception. You who dispel all disputes and bad dreams. You dispel all violent epidemic disease. O TURE, most excellent and sublime! Thank you for this article, it is very enriching. Is there any way I can see this complete painting? Thank you. May Buddha Arya Tara watch over you and your loved ones.